Sci-fi creators are often in sync with their time when you think about it. Although they deliver speculative fiction, they are deeply influenced by the events taking place during their own lifetime. They are also well documented and able to go into detail about inventions, technologies and societal evolution that has not been thought of before. Sometimes, they can even predict the future in an unexpected way. Think of Star Trek’s food replicator. Well, we’re not so far from achieving that with 3D-printers! Si-fi authors have an anchor in the present with some plausible perspective on the future. It is true in literature as well as in movies. It is easy to understand that Gozilla happened for a reason when it was first broadcasted in 1954. This giant monster coming out of the sea to destroy entire cities and leaving radiation behind tells us metaphorically about the trauma of the nuclear disaster of Hiroshima and Nagasaki. 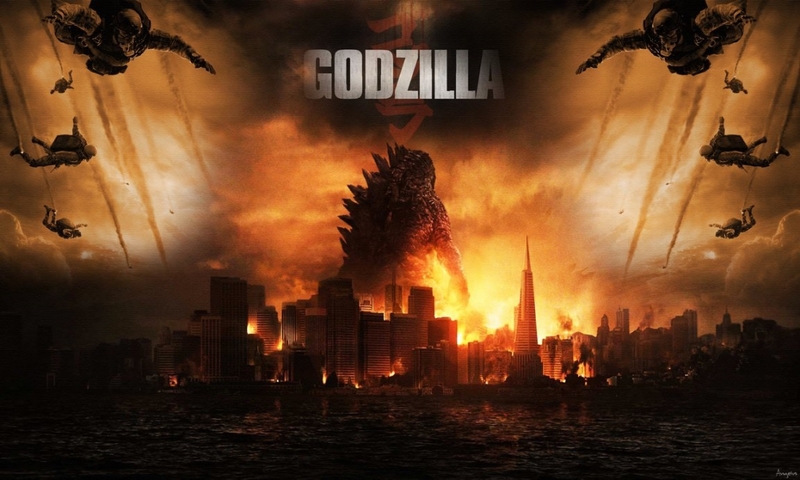 Consequently, it’s not at all surprising that the brand new version of Gozilla got broadcasted in 2014, following the 2011 Fukushima power plant disaster. 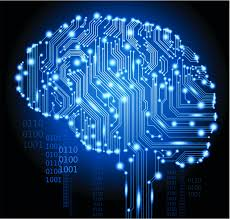 The technological singularity hypothesis is that exponential progresses in technologies will result in artificial intelligence exceeding human capacity and control in the near future. This will lead to a radical change or even end of our civilization. The estimated time of the singularity is somewhere between 2030 and 2040. It’s been almost a century that the singularity has been showing up in films. 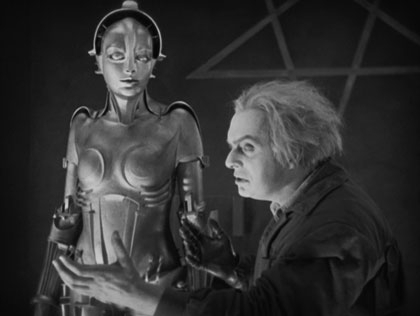 Think all the way back to Metropolis, the 1927 Fritz Lang movie where a robot looking like a woman takes over a whole city with her seducing powers. It sure was not called like that in those days but that movie was quite visionary. I clearly remember watching Westworld (1973) when I was a child. It starred Yul Brynner as an android in a futuristic Western-themed amusement park. Guests paid an expensive price and could indulge in any adventure with the android population of the park, including sexual encounters and even a fight to the death, depending on the android model. Needless say the robots started to rebel and took over in total chaos. Now, isn’t it amazing to read in current scientific magazines that humans will engage sentimental and even sexual relationships with AI? It’s not a coincidence that the movie Her, starring Scarlett Johanson and Joaquin Phoenix got broadcasted in 2013 : the story is totally anchored in its epoch. It tells us about lonely Theodore getting into a relationship with his iOS. The program speaks (Johanson’s voice), thinks, and has a wicked sense of humor. In no time she becomes his best friend and love. In the end though, she evolves so much her intelligence is inconceivable. She does not need to relate to humans anymore and drifts away. This film is food for thought. What is intelligence? What is the nature of love? What is the place of technology in the development of mankind? In Transcendence, Johnny Depp is a brilliant scientist taking part in the creation of a sentient computer. He gets shot in an attempted assassination and ends up caught between life and death. His loving wife decides to upload his conscience in the computer and he becomes omnipotent shortly after he gets connected with the internet. 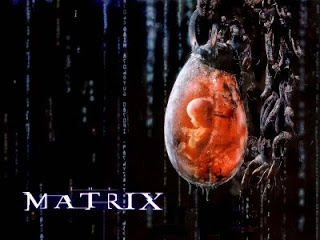 The movie then describes the dangers of an uncontrollable yet brilliant mind ruling the whole of humanity. Other movies develop that idea of one single mind ruling/saving the world, from the Wachowski’s The Matrix to Luc Besson’s Lucy. It’s unlikely, though that the singularity will develop in that direction. It’ll supposably result in a network of intelligences, both human and artificial, connected and evolving together. 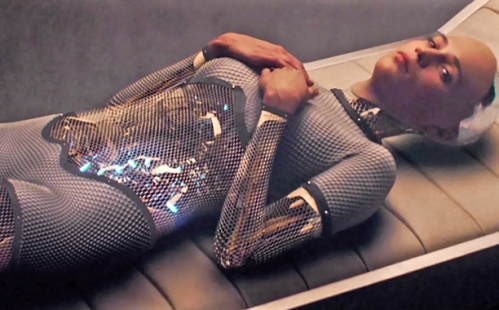 In the soon to be released Alex Garland’s Ex Machina the AI is female and seductive (again!). This movie revolves about the question of the AI’s will to survive. In this context, is the AI to be trusted or is she manipulative? This is interesting but not very new either: in the movie Terminator, the self-aware artificial intelligence system “skynet” associates humans with enemies, seeks to destroy humanity and to control the Earth. What a program !